Total sea ice extent on the northern hemisphere during the past years, including climate mean; plus/minus 2 standard deviations. The ice extent values are calculated from the ice type data from the Ocean and Sea Ice, Satellite Application Facility (OSISAF), where areas with ice concentration higher than 15% are classified as ice. The total area of sea ice is the sum of First Year Ice (FYI), Multi Year Ice (MYI) and the area of ambiguous ice types, from the OSISAF ice type product. The total sea ice extent can differ slightly from other sea ice extent estimates. 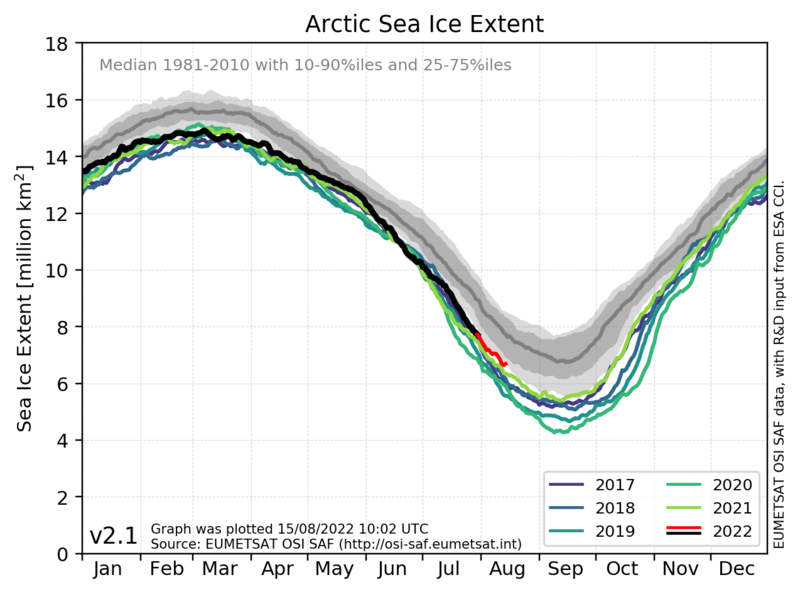 Possible differences between this sea ice extent estimate and others are most likely caused by differences in algorithms and definitions. The sea ice extent data from 1979 till today is composed by a Climate Data Record (CDR, OSI-409a), an Interim CDR providing updates with one month delay to the CDR (ICDR, OSI-430) and an operational setup that calculates sea ice extent for the period between the ICDR and today. Sea ice extent in recent years for the northern hemisphere.